Strange symbols adorn the architecture at 51 rue de Montmorency in Paris. The house was in fact built by the city’s most famous alchemist, who many believe achieved great wealth through his discovery of the Philosopher’s Stone. Saintly bones pressed into a wax effigy of a Catholic superstar. Nicolas Flamel was born sometime in the 14th century and worked for most of his life as a bookseller. However, many believe that he happened upon an arcane text that revealed the secrets of turning ordinary metals into gold. It is true that Flamel was a great philanthropist, but whether or not this wealth came from alchemy is the stuff of debatable legends. Nevertheless, Flamel’s name has become inextricable from alchemy, and he’s seen as one of its great practitioners by many interested in the transformation of elements into greater forms. 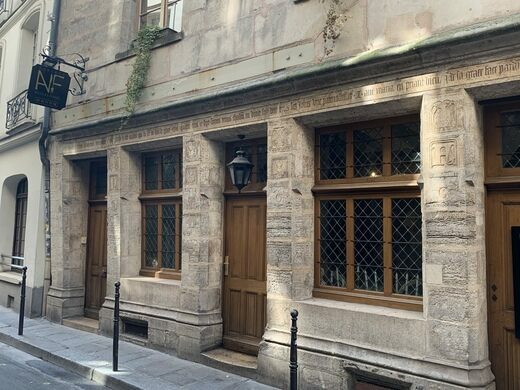 The house on Montmorency street was built by Flamel in 1407 and is now the oldest stone house in Paris. It’s here where Flamel is said to have carried out his experiments in alchemy. Flamel died in the 15th century, but not before designing his own tombstone with its own symbology that is now on display at the Musée de Cluny. The church he was originally buried in, the Church of Saint-Jacques-de-la-Boucherie, has since been torn down, leaving only the looming Tour Saint-Jacques. A street by the tower has been named for Flamel, which intersects with one named for his wife Pernelle. As for the former home of Flamel, it is now an atmospheric restaurant, appropriately taking the name Auberge Nicolas Flamel. The building is still the same from the outside, but the interior has been converted into a restaurant, Auberge Nicolas Flamel.